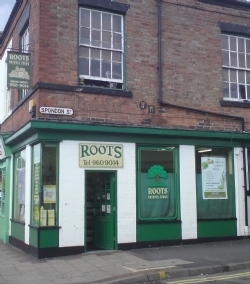 At Roots we care about your health. Owned and run by Ken Dyke Medical Herbalist and Nutritionist. Ken and the rest of the Roots team are dedicated to ensuring you can lead a balanced and healthy life whilst still enjoying delicious food. Huge range of organic, vegan and vegetarian food. Largest herbal dispensary in the Midlands. Please click here to ask us a question, give us a call, or to find out where we are. We’d love to see you or hear from you.